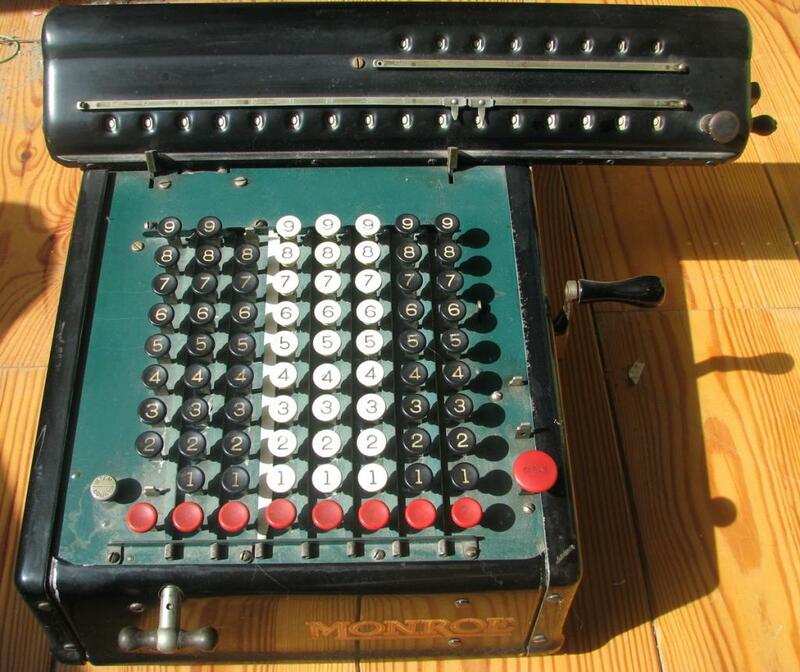 The new and redesigned model Monroe Calculating Machine, which came out in 1921, and was a big hit all over the world. 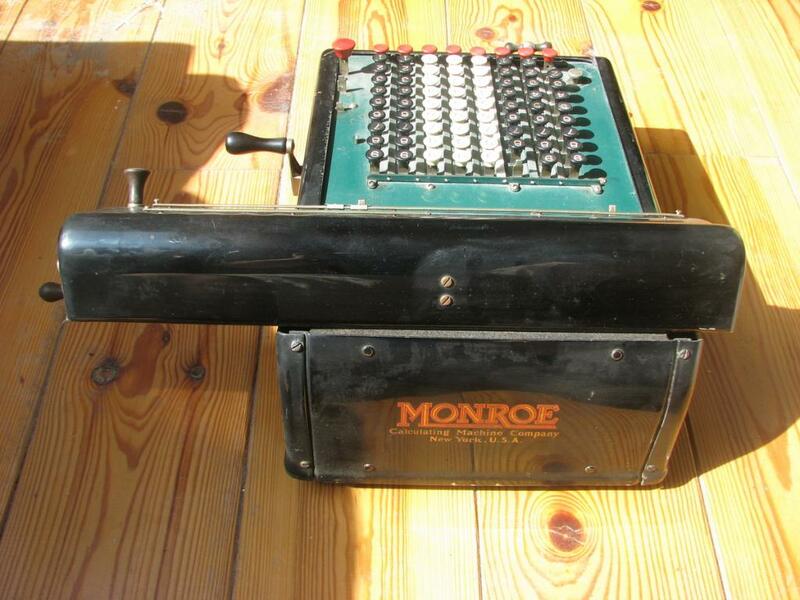 The Monroe calculating machine company still exists as Monroe Systems for Business , and they publish a fair bit of information on their history on their website (look under the "company" header), among which an interview with Frank S. Baldwin and with Jay R. Monroe. This particular machine is missing a few keytops, which I have not gotten around to replacing, yet. The "repeat" and "non-repeat" keys are missing on the right side, and other than that, there are a 1 and a 9 key missing. Operation is realtively simple - choose addition/subtraction or multiplication.division by means of the repeat/non-repeat keys, set the input on the keyboard, and turn clockwise for addition/multiplication, counterclockwise for subtraction/division. There is a key for the item counter, which keeps the one in the leftmost column depressed when the non-repeat key is selected and the rest of the keyboard clears. This allows an intermediate total and a grand total to be recorded. Clearing the registers is effected by turning the handle on the carriage, clockwise for the counter, and ccw for the result register. The carriage lifts itself when the result register is being cleared. 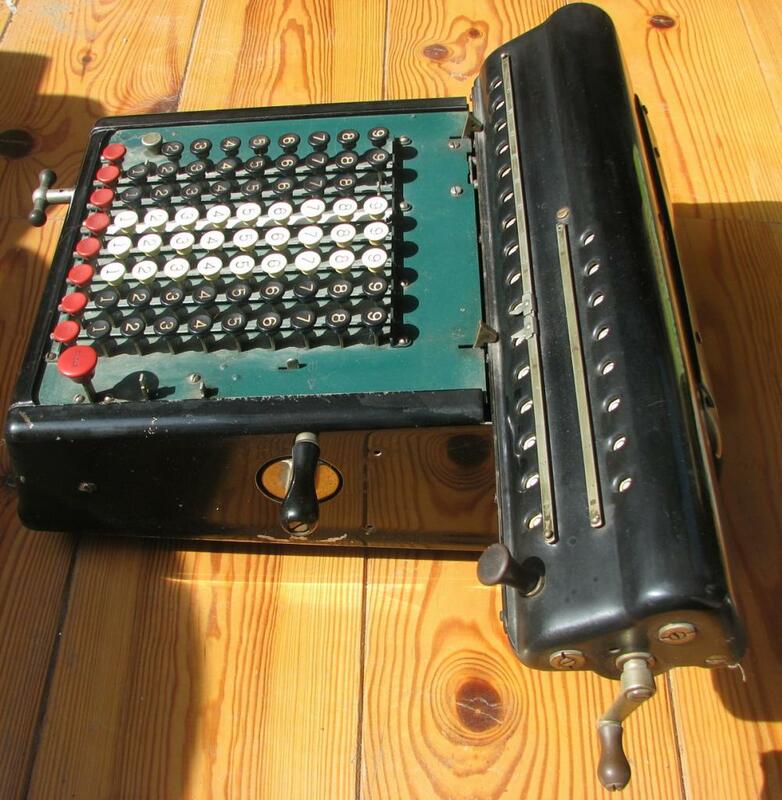 The system on which this calculator operates is a kind of stepped cylinder, although it is really more of a stepped gear sector here - there is a five-toothed gear sector on the left of each input row, and a four toothed gear sector with teeth of increasing lengths on the right. 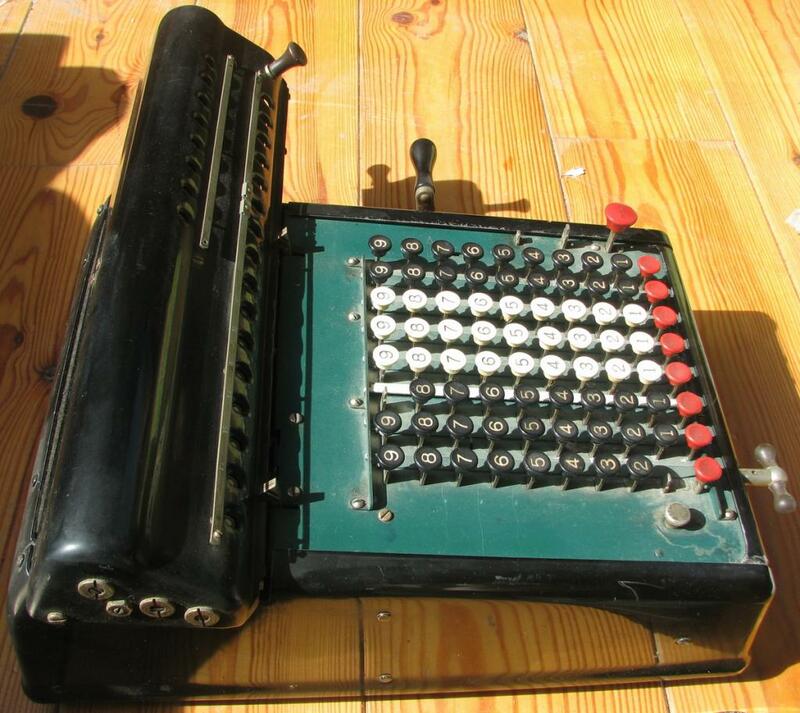 The latter has five positions, and depressing a key will shift the sector the correct amount to the left for adding the number that appears on the corresponding key. For keys 5-9 the lefthand segment with five teeth also shifts to the right to engage with the intermediate gear that ultimately connects to the result register. This system is quite reminsiscent of the "biquinary" system in the Brunsviga 10. For pictures, see the page on the Monroe F.